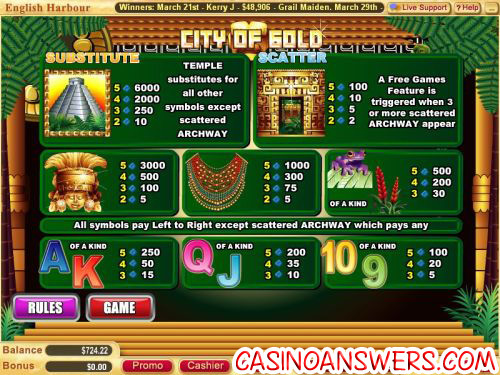 City of Gold Video Slot Guide & Review - Casino Answers! City of Gold is a 5-reel, 25-line video slot developed by Vegas Technology. It has wild and scatter symbols along with a free spins feature. You can find City of Gold on multiple casino platforms. For the purposes of this review, we will be reviewing the version found on the Vegas Technology platform. You can play City of Gold at Vegas Technology casinos like English Harbour Casino or at Random Logic casinos like 888.com Casino. The Archway symbol is the scatter symbol in City of Gold. When three or more of these symbols appear, you will trigger the free games feature. You will be awarded 15 free spins and a 3X multiplier. All of your prizes will be tripled. The free spins feature can be re-triggered. The free spins will be played at the paylines and bet of the triggering spin. Wins you receive from the free spins will be added to your payline and scatter wins. For players who like to play a lot of spins without doing too much clicking, City of Gold has an autoplay mode. In the autoplay mode, you can set the number of spins (from 5 to 500), number of seconds between spins (0.25 seconds to 2 seconds), to stop once all spins have completed, to stop when the jackpot is won, to stop if a win exceeds or equals (from $50 to $250), to stop on any win you receive or to stop if credits are increased/decreased by (from $50 to $250). You can cancel the autoplay mode at any time. City of Gold is a good video slot for casual players and high rollers alike. It has a large betting range, some healthy jackpots and an exceptional free spins feature. If that’s what you look for in a video slot, we advise you to take advantage of the 100% up to $800 signup bonus offered at English Harbour Casino. Where can US players find a casino to play City of Gold? Players located in the USA will be able to play the City of Gold video slot at any Vegas Tech casino, including English Harbour Casino. Do I need to download any software to play City of Gold? City of Gold is one of the many games offered on the Flash version of English Harbour Casino. If you have any problems playing the City of Gold Flash game on your computer, you can download the newest version of Adobe Flash Player. Where can i find the gold city slot machine? 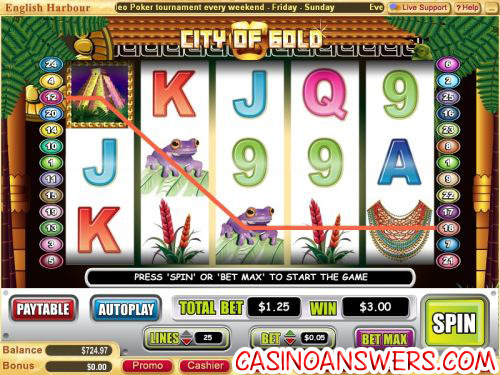 What casinos offer the Golden City Slot machine game?